When it comes to Christmas decorations, nothing puts you in the Christmas mood better than magical outdoor christmas decorations. Beautiful outdoor christmas decorations make you fall in love with Chrristmas instantly. It’s like love at first sight: the moment you see magical christmas decor, you fall in love with Christmas over and over again! And every time you leave your house and come back home, magic welcomes you back home! That’s why it is important to create the best outdoor christmas decorations in order to bring the full joy of Christmas to your home. In this post, you will see 9 of the most magical outdoor christmas decorations ideas that will bring true joy to your home. They take home decor to a whole new level. Talking about home decor, here are three of the most popular Christmas quotes that will bring the true meaning of Christmas to every heart, and also to understand deeply why the fullness of Christmas joy is brought to life by amazing outdoor decorations. illuminates (light or joy): bringing light or joy to your home and to the people inside your home. So by creating magical outdoor christmas decorations, it helps you to experience the true meaning and joy of Christmas to the fullest. Deck out your front door with a magnolia leaf wreath and garland. Spice things up with ornaments in red, silver, and gold and you are ready to receive visitors! Traditonal, rustic Christmas decorations are so creative and fun when you need a bit of variety. Sometimes rustic Christmas decor is all you need to surprise the kids and give them a bit of lessons in beautiful country living. One Christmas wreath can bring real fun; two wreaths can impress the guests too. But when you go for adorable Darling Christmas Wreath Trio, you can potentially triple the magical moments in your home! 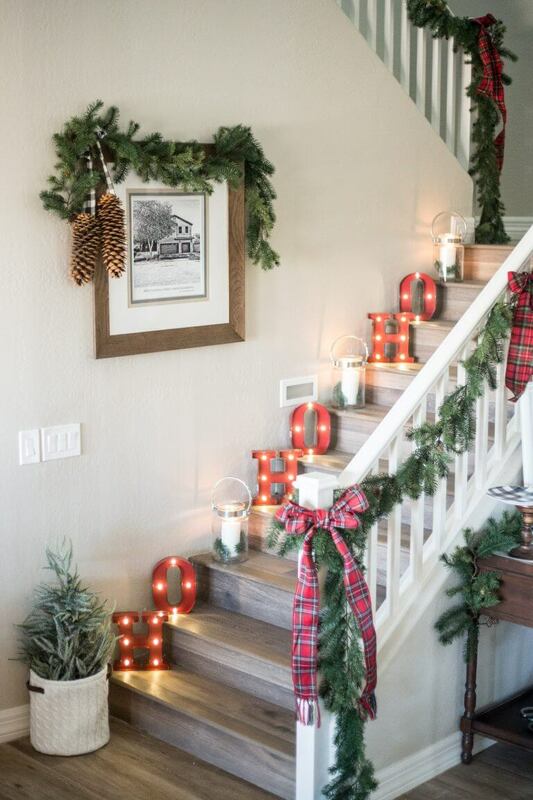 If you have always wanted to do a makeover of your home, Christmas is a great time for a beautiful makeover…and it starts from your front porch. Sometimes Christmas decor can cost an arm and a leg. 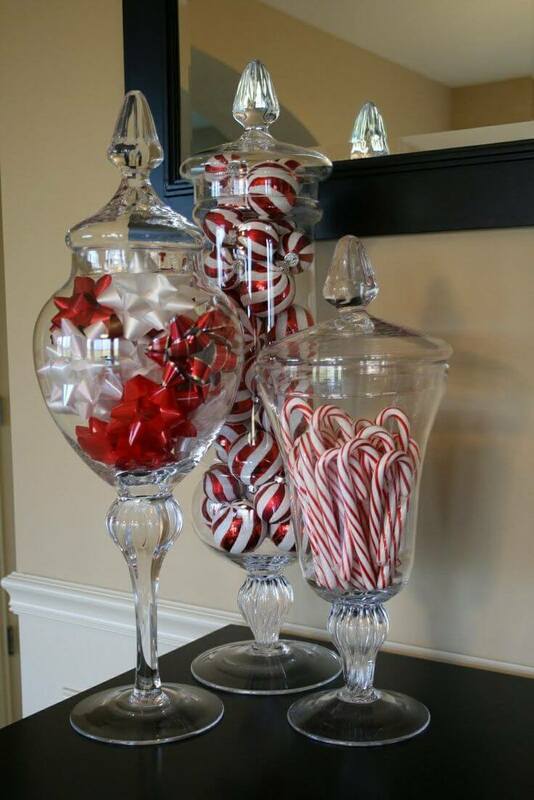 You can keep thing within budget by reaching for apothecary jars and some simple candy canes, ribbons and ornaments from the dollar store. Light up your home with Christmas spirit and still keep the bank in a good shape. That’s the spirit! Santa Claus comes through the chimney but your guests come through the front door. Deck it. Christmas decor can come in all shapes. Just be creative. An obelisk-shaped christmas tree, for example, can be decorated to your own liking. 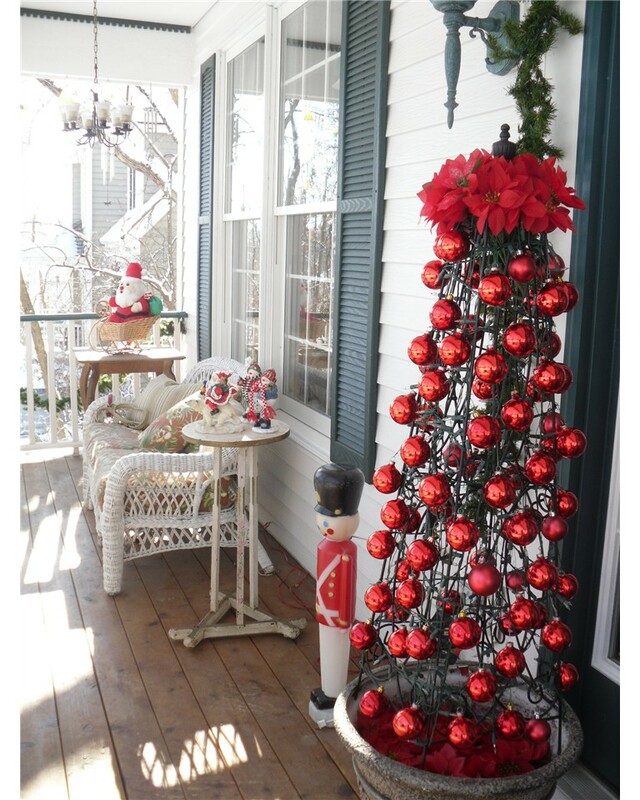 This elegant front porch Christmas decor takes holiday decorations to a whole new level. And it’s yours to try! Bring some lights, beauty and sharing and caring to your home this Christmas. When you gather around the dinner table with family, friends and loved ones, the magic becomes complete and memorable. And it all starts with amazing outdoor Christmas decorations.